I joined the Digital and Technology (DaT) Fast Stream in September 2014 after making my way through the assessment process. My career before then had been varied: I’ve worked in analytical roles in the NHS, and most recently in location planning at a large national retailer. I’ve always been interested in the latest technology and particularly the positive impact of a good online experience. I set up hobby websites back in my Sixth Form days, but prior to that, my actual technology experience is quite limited. I graduated in Human Geography from the University of Birmingham in 2011. The key thing is that, across the scheme, there are many people with no previous experience working in a digital environment. An interest and understanding of how digital and technology can transform lives is all that is required! My first role was with the Business Transformation Group at DWP, in what is termed a ‘Digital Hub’. These hubs are where the delivery of digital projects are concentrated. They’re located in London, Newcastle and Leeds, where I was based. This was a really fantastic space in which to work, with a strong community of digital experts, including the DWP Digital Academy. I really enjoyed living in Leeds; it’s a very compact city with great places to enjoy outside of work, and everyone is very friendly. My role was Product Manager for a large, public facing service. I had several responsibilities in this role, which included managing data and developing KPIs, analysis, setting up an agile team environment and acting as communications manager for correspondence. I also had direct exposure to Senior Civil Servants across DWP, due to the profile and importance of the service. One of our key achievements was implementing a new employer verification process in a contact centre, where communications from the public are processed. It was very rewarding to visit operational staff, who work very hard with existing systems. Unfortunately, some of these are legacy systems and no longer fully accommodate the needs of processing staff. This is why government is redesigning services, not just those that are public facing, to take into account user needs. I’m currently working on several projects as a Delivery Manager at the Home Office. This placement has been an extremely ‘agile’ experience. I gain an excellent vision of the wider portfolio of projects through leading the ‘Front Door’ process, which you might have read about in Stacey’s blog. We’ve just set up an ‘Our People’ wall, which you can see in the image. It’s growing fast and helps to raise awareness about digital within the department. The DaT scheme is a great way to learn more about digital delivery and large-scale transformation. 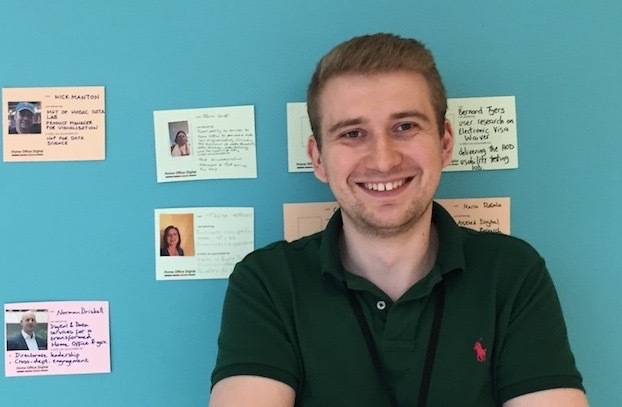 We’ve all recently been trained in agile at the Government Digital Service (GDS). There’s a really strong community and we all support and learn from each other. My next post is at HMRC, where I’m going to be a Digital Customer Engagement and Intelligence Analyst. I’m really looking forward to the challenge!